Private boats are hired for the tourists to have a wonderful experience of viewing numerous facets of the holy city. Unlike the motorboats and modern cruise ships, the boats used for the ride are those operated with oars. The traditional form of boat riding is one experience that you would take back home and cherish for long. You may come across burning pyres, the Hindu tradition of cremating dead bodies, at the Manikarnika Ghat. Greet a huge number of seagulls that float over the glittering water waves and give a great company to the boat riders. You may also choose to ride the boat in the afternoon. This will allow you to attend the divine aarti (evening prayer) of River Ganga from the boat. The scene of hundreds of oil lamps revering the holy river is extremely pleasurable. 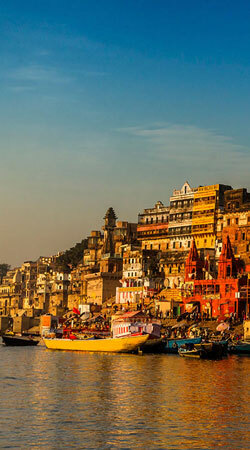 Start the boat ride at dawn from Dashashwamedh Ghat, where an array of boats adorns the scene. As the oarsman starts pushing the boat in the serene water, the splashing sounds breaking the early morning silence is like a melody to the ears. Watch the temples located near the ghats blessed with an amazing orange hue in the morning that presents a magical scene. See the ghats slowly coming to life with people engaging in bathing and praying rituals. Listen to the sounds of ringing bells and admire the rainbow formed by the colorful clothes spread for drying across the banks.